Hot and thirsty from playing outside, a small child grabs the sports drink bottle in the garage and dies from drinking the deadly chemical the bottle contained. Grandma trips on her throw rug, the fall causes injuries so significant she eventually requires hospice care. A speeding car full of college students strikes a bridge head on, driver with phone in hand, the last text seconds before impact reading “LOL.” Not one seatbelt in use, all are dead at scene. These descriptions are harsh. Tragic. Real. Sometimes friends, families, and neighbors never stop grieving for those lives lost. Fifty years ago, these occurrences were referred to as accidents – events that were “inevitable, random, and unavoidable.” But with advancements in the science of injury, the Centers for Disease Control and Prevention’s (CDC) public health experts know these events are preventable. Now replacing the word “accident” with the phrase “unintentional injuries,” the experts also understand that prevention depends on changing the public attitudes and behaviors that impact injury and fatality rates. Specific metropolitan and nonmetropolitan unintentional injury data can be found in the CDC’s Web-based Injury Statistics Query and Reporting System (WISQARS), an “online database that provides fatal and nonfatal injury, violent death, and cost of injury data from a variety of trusted sources.” Reviewing the 2015 data, the top three categories of fatal unintentional injuries are the same for rural and urban areas. However, there is a notable difference in ranking. For urban areas, poisonings, transportation injuries, and falls rank greatest to least. But for rural areas, motor vehicle-related injuries push poisonings to second, with falls also ranking third. What causes fatal unintentional injuries in the nation’s homes? Poisonings, falls, fires and burns. Researchers at Johns Hopkins Center for Injury Research and Policy and Bloomberg School of Public Health reported the prevalence rate of poisonings is 43%, falls 34%, and fires and burns both at 9%. Whether a home is rural or urban, the Hopkins researchers shared 29 evidenced-based prevention strategies geared to decreasing home injury rates and fatalities. A recent CDC MMWR Rural Health Series report reviewed 5 rural categories of potentially preventable deaths. The categories included heart disease, stroke, chronic lower respiratory disease and cancer. In the 5th category – unintentional injuries – a significant disparity is highlighted: the rural death rate is 50% greater than the urban rate. The report goes on to suggest that the number one cause contributing to this disparity is motor vehicle trauma. Dr. Richard Sidwell, a Des Moines, Iowa, trauma surgeon and chair of the American College of Surgeons Rural Trauma Subcommittee, said no database makes those rural motor vehicle trauma statistics look better. 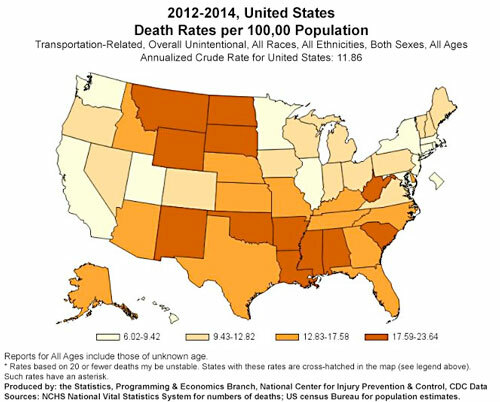 State-level traffic deaths, 2012-2014, created using CDC’s WISQARS data. If you are injured in a rural environment with the same injury as in an urban area, you are at least 50% more likely to die. This is a consistent finding. 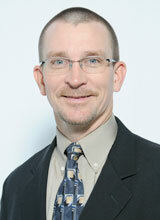 Dr. Richard Sidwell, trauma surgeon. But despite the barriers of distance and expertise, Sidwell, who has passion for rural trauma care, said he also looks at the mortality rates in terms of delays. In April, the National Highway Traffic Safety Administration released Rural/Urban Comparison of Traffic Fatalities. Another Rural Killer: Falls. Yes, Falls Kill. Falls, a common cause of death in both rural and urban areas, are an unintentional injury that intersects with trauma, since even ground level falls (GLFs) are traumatic events that can result in multiple injuries requiring specialty surgical care. In the aging population, experts say that GLFs are often “sentinel events” that makes obvious this population’s frailty, a condition contributing to death rates. Some GLFs even have death rates near 50%, especially those associated with significant head injuries, like brain bleeds. 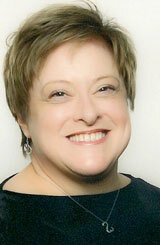 Dr. Mindy Renfro, physical therapist and fall expert. Dr. Mindy Renfro, a University of Montana geriatric physical therapist who’s been a member of the CDC’s and the National Council on Aging’s work groups addressing falls, points out that there are many theories linked to differences between urban and rural fall fatality rates. I will pose this question to patients: ‘If you fall, how long will it be until someone finds you?’ Because that’s where the life and death part usually comes in. Renfro, like Sidwell, points to the impact of delay from time of fall to definitive help. Renfro said when she talks with patients, students or public audiences, she uses a specific comment to highlight just how devastating falls can be. Sandwiched between motor vehicle fatalities and fall deaths are rural deaths from poisonings. For both rural and urban areas, the leading cause of unintentional deaths from poisonings is overwhelmingly drugs of abuse, and specifically opioids. But a look into the non-drug poisoning data is also important. 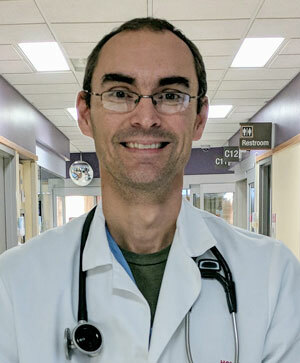 Emergency medicine physician and toxicologist, Dr. Travis Olives, who practices with the Minnesota Poison Control System based in Hennepin County Medical Center, Minneapolis, is no stranger to rural fatal toxic exposures since he previously practiced emergency medicine in a Wisconsin Critical Access Hospital. Olives said the most common non-drug poisoning calls to their system from rural areas fall into several main categories. Dr. Travis Olives, physician specialist in emergency medicine and toxicology. Olives said “needless and preventable” exposures also happen because of the tendency to keep toxic liquids in containers that normally contain safe liquids. The Health Resources and Services Agency, HRSA, reminds the public that the “best way to prevent poisoning is to learn and talk about” poisoning risks before an emergency. The agency provides partial support for the nation’s 55 poison control centers, an integral part of the public health system and especially important to rural areas. These centers, staffed by specially trained nurses, pharmacists and doctors like Olives, are available 24 hours a day, providing free and confidential assistance. Olives said that he wants the public to understand – and especially the rural public who face the resource limitations and distance issues he knows so well – that an immediate call to the 1-800-222-1222 poison control center number can make the difference between living and dying from a drug or non-drug poisoning. The big theme worth hitting on over and over again is making that call and getting that early advice to answer the question: ‘I think I have a problem, how big of a problem is it? Olives acknowledges that this coordinated work is one of the reasons their poison control center calls itself a “system.” He also hopes that “system” also helps bring awareness to the wider expertise they provide other than childhood ingestions. For a comprehensive and unified fall prevention effort, advocacy groups, such as the National Council on Aging, and members of the American Physical Therapy Association (APTA) and the American Occupational Therapy Association (AOTA), join up with federal prevention programs, like the CDC’s STEADI program. Renfro said fall prevention strategies require forethought, time and planning, but the most important prevention strategy is actually having the frank conversation about fall prevention in the first place. To emphasize one of the most important aspects of fall prevention – the gap between giving prevention advice and having that advice implemented – Renfro said she uses a humorous example from her own family to teach audiences and students. 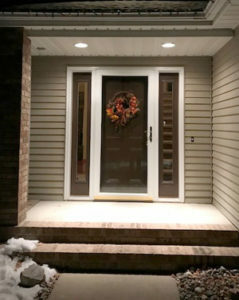 Renfro shares this personal story as a good example of how people might smile, head nod, assure you they’re serious about eliminating their fall risks, but then not make any changes at all. 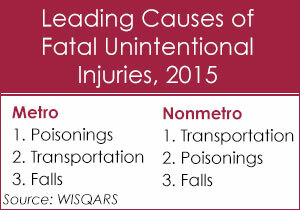 Poisonings and falls, number two and three on the WISQARS 2015 rural fatality list, are important public health issues. But, it’s that rural motor vehicle fatality and disparity rate that owns what might be the most sobering of all unintentional injury statistics: the 50% difference in fatality rates compared to urban. Though many factors impact fatality rates, trauma surgeon Sidwell said that decreasing the time to definitive care after a patient reaches a rural hospital could help make a difference. How can that time interval be shortened? Sidwell said it starts with training efforts. 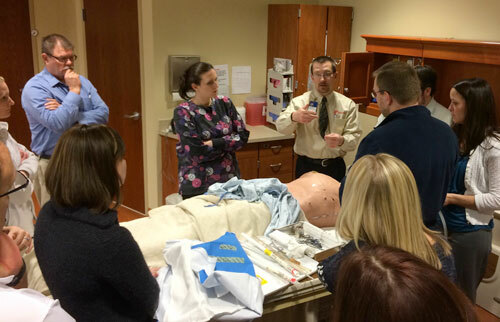 Reviewing important history, Sidwell said the popular-and-sometimes-mandated Advanced Trauma Life Support (ATLS) education course actually had rural beginnings in the 1970s due to the efforts of an orthopedic physician. The orthopedist’s family tragedy involving an airplane crash in a cornfield prompted him to recognize that rural trauma care was a “system, not a doctor” problem. He and several colleagues then developed ATLS for rural providers so they’d have the training needed to provide basic care to the severely injured patients not often seen. Sidwell providing RTTDC training in Carroll, Iowa. The Rural Trauma Team Development Course (RTTDC) “emphasizes a team approach to the initial evaluation and resuscitation of the trauma patient at a rural facility.” The course, its 4th edition completed in 2016, has been gaining traction, building evidence for its effectiveness. As of 2011, it’s an official American College of Surgeons’ educational program, offering Continuing Medical Education (CME) units. The Federal Office of Rural Health Policy offers Flex Grant funding for the RTTDC. It’s been used by several states, for example Utah, Hawaii, and Massachusetts. Sidwell, an author on the most recent update, said the course is taught by trauma surgeons and most often is used in two ways: as part of an urban trauma center’s outreach; or as part of an individual state’s rural health infrastructure. Some states, such as Arkansas, use state health department funding to provide courses in their state. In 2016, the RTTDC reached 3,000 participants through 175 course presentations. Sidwell said the course not only brings knowledge, it builds relationships. Sidwell also points out that being on a trauma team doesn’t end with bringing education to healthcare providers. It also means bringing education to the public. Trauma surgeons are often involved with multiple public health preventive efforts, such as helmet laws or distracted driving prevention. He said he also believes in public health initiatives like the recent National Academies’ Health and Medicine Division’s conversation on “getting to zero,” a plan integrating military and civilian trauma systems. Additionally, a September CDC MMWR report looked at seat belts in relationship to rural fatalities. That report also highlighted the National Safety Council’s and U.S. Department of Transportation’s October 2016 launch of Road to Zero initiative, an initiative with a goal to eliminate road traffic deaths in the United States within 30 years. This entry was posted in Features and tagged Health conditions, Injuries, Iowa, Minnesota, Montana, Mortality, Occupational therapy, Physical therapy, Public health on November 29, 2017 by Kay Miller Temple.